Limerick’s Chiedozie Ogbene is closing in on a switch to Brentford. 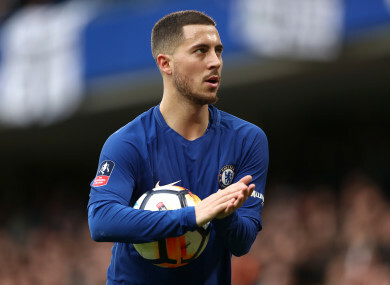 Manchester City reportedly want to sign Chelsea’s Eden Hazard in the summer, with the Belgium valued at around £150 million. Limerick’s highly-rated winger Chiedozie Ogbene is understood to be close to joining Championship side Brentford. Manchester United are among the clubs interested in Bayern Munich midfielder Arturo Vidal. Red Devils goalkeeper David De Gea says he is “very happy” at Man United, amid reports from El Confidencial that Jose Mourinho is planning a swap deal involving him and Cristiano Ronaldo. Monaco midfielder Fabinho, who both Manchester clubs have been linked with, has indicated a desire to leave his current club. West Brom are planning to make an £18 million bid for Watford attacker Troy Deeney. Newcastle and Liverpool are targeting £17.5 million-rated Gremio striker Luan. Joe Hart is hoping to end his West Ham loan spell. With the World Cup on the horizon, the goalkeeper feels he needs first-team football to be in with a chance of featuring for England this summer. The London-born former Ireland international had early spells at Bradford and Coventry, but it was on the back of some impressive displays at the 1994 World Cup that he joined Liverpool as a promising youngster the following September for £3.6million, making him the most expensive defender in Britain at the time. The centre-back spent the next six years at Anfield, making over 100 appearances. However, Babb was rendered surplus to requirements not long after Gerard Houllier became the sole manager of the club. His indifferent form led to him being linked to clubs such as Crewe, QPR and Derby. But following a short loan spell with Tranmere Rovers, Babb resurrected his career at Sporting Lisbon. Despite only spending two years with them, Babb enjoyed success in Portugal, helping the club to a league and cup double during his time there. The defender had a further two years at Sunderland, before retiring from the game at the age of 33 in 2004. Since then, Babb has worked as a pundit for Sky Sports, while he also spent just under two years managing Conference South side Hayes & Yeading United between 2013 and 2015. Email “City in for Hazard, League of Ireland youngster set for Championship move and all today's transfer gossip”. Feedback on “City in for Hazard, League of Ireland youngster set for Championship move and all today's transfer gossip”.